Historic Way of Preserving Meat Adds Piquancy. Before the advent of refrigeration, preserving foods was a challenge. Every culture developed some version of pickling, or preserving in a salty brine or vinegar. Herbs and spices, such as mustard seed, garlic, cinnamon or cloves, were often added, not only for their flavor, but because they helped with the preservation process. If the food being preserved had a high enough water content, it could be packed in salt alone. Salt pork and salt beef were staples of a sailor’s diet before steam engines made ocean crossings much less time-consuming. 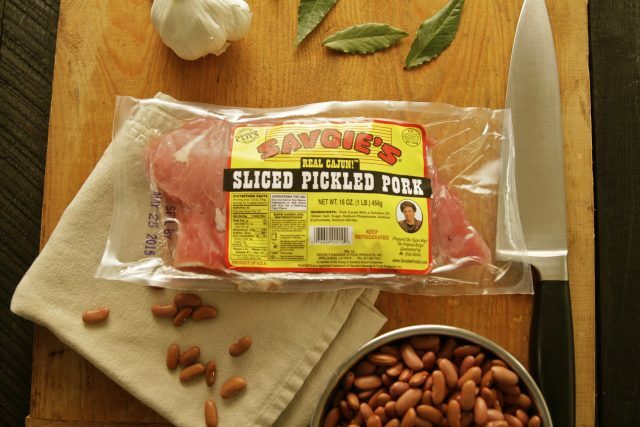 Pork was a cornerstone of the diet of the French settlers who lived in Acadiana, now called Nova Scotia. When the British forced them out of their homeland many found their way south to French-speaking Louisiana, where wild boar was plentiful, allowing the Acadians to retain pork in their diets while evolving its preparation with the different herbs and spices they found in their new home. A Recipe Born of Frugality. As Native Americans did with the buffalo, the Acadians, a.k.a. Cajuns, utilized virtually every part of the pig. Before the advent of refrigeration and commercial curing, meat not destined for immediate consumption was often rubbed with a mixture of salt and saltpeter and layered with mashed cloves, ground allspice, chopped onions, bay leaves, and more salt, then stored in barrels where it would last as long as a year. What Pickle Meat Brings to the Red Bean Pot. Pickle meat, a.k.a. 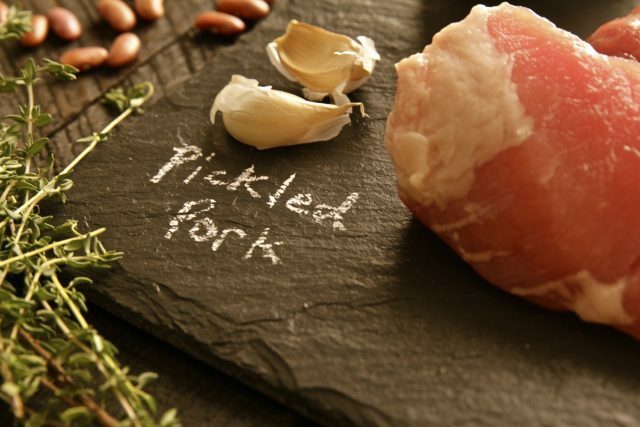 pickled pork, remains a staple in the Louisiana kitchen, where it is most frequently used to season pots of long-simmered beans, smothered vegetables, or greens. The meat, rendered supremely tender and pre-seasoned from the brine, can be relied upon to break down and saturate the other ingredients in the pot with its delicious flavors. Hold off on adding additional salt before tasting the cooked beans — the salt released from the pickled meat should be plenty to season the pot. Still Acadiana Made, Now Widely Available. Combine everything except the pork in a non-reactive saucepan. Bring to a full boil and retain at the boil for 3 minutes. Cool the brine and add it to a stainless steel, glass, or plastic container. Add the pork, stir thoroughly, and push the meat down to fully submerge it in the brine. Cover and refrigerate for at least three days before using as a seasoning meat. Drain, rinse, and drain the meat again before use to remove all traces of seasoning aromatics.